Mango is one of the most versatile of fruits and can be added to a wide range of dishes from salads to desserts to main course. Before the mango season ends, I wanted to share another classic Indian dessert prepared with ripe mangoes. Today we will learn how to prepare mango phirni following our easy recipe. Soak rice for 30 minutes. Drain the water completely and grind it to a coarse paste. Dilute the paste with 1/4 cup of water and keep it ready. Blanch nuts - Soak almonds and pistachio in hot water for 15 minutes and peel the skin. Slice it into thin strips. Boil milk first. Once milk starts boiling, reduce the flame to low and add the ground rice paste. Add condensed milk, cardamom powder and cook for a few seconds until everything gets blended well. Switch off the flame. Allow it to cool. Refrigerate for an hour. Remove from the refrigerator, add chopped nuts, mango puree,saffron, chopped mangoes and put it back into the refrigerator to chill further. Garnish with few chopped mangoes, nuts and serve chilled. It tastes so heavenly. 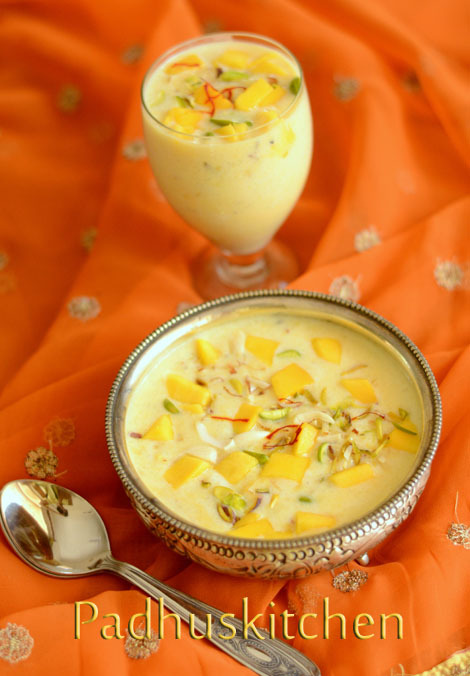 Do prepare this exotic mango dessert and send your taste buds on a trip to heaven. Note - Use only very sweet mangoes. If you can get alphonso mangoes, do use that. u decorated very nicely ! tempting pictures ! Luvely to see Padhu, would try it for my Birthday! Wow! looks awesome and it tasted yummy. Thanks for sharing exotic dishes Padhu. I was looking for a mango recipe and saw this. The photo is so pleasing and superb! Love to make this soon. Awesome recipe! Relished it till the last drop! Lipsmacking! Yummy Dishes.Thank you for the recipes. Whenever I feel like eating or preparing something.. Ill just see Padhus kitchen.Thanks a lot. Clear Steps for all the recipes..